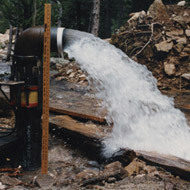 Wyoming Water Well Drilling is another area where we have extensive experience. We cover several counties in southern Wyoming and have a physical office location in Laramie. Our extensive experience providing Wyoming water well drilling services has given us the expertise you need to secure the proper well permits from the proper state agency. We use the latest technology for water well drilling and our up-to-date equipment ensures you will get the most out of your new water well. So if you are located in the Laramie area and are in need of an expert Wyoming water well drilling contractor, please contact us today.